Ronald Lynn “Ron” Ramsey is a patriot. Ronald Lynn “Ron” Ramsey is a patriot as the Lieutenant Governor of Tennessee and Speaker of the State Senate. 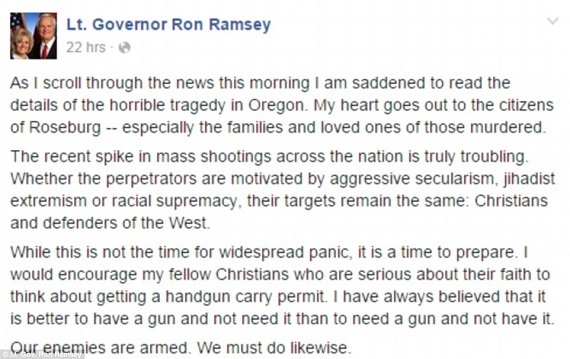 Ronald Ramsey the Lieutenant Governor of Tennessee has called for Christians to arm themselves after it was revealed the gunman who killed nine students at Umpqua Community College in Roseburg, Oregon this week asked his victims to state their religion before shooting them in the head. Ron Ramsey encouraged Christians who are ‘serious about their faith’ to obtain a handgun carry permit for protection. Lt. 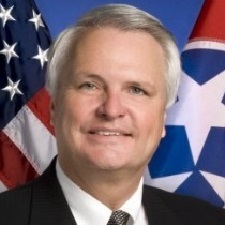 Governor Ramsey, who included a link with his post detailing how one can apply for a handgun permit in Tennessee, concluded that although it was not the time for ‘widespread panic’, his ‘fellow Christians’ needed to prepare. At Oregon’s Umpqua Community College – Nine people were killed and another nine were injured after Chris Harper-Mercer, 26, opened fire in his writing class on Thursday, October 1, 2015. He eventually shot himself dead after exchanging fire with police, according to authorities. Witnesses said he made his victims stand-up and say if they were Christian before telling them: ‘Good, you’ll see God in a second’ and shooting them.